Transplanted Ottawa performer Missy Burgess says she wants to establish a regular “open stage” in Sarnia to encourage new talent and strengthen the local cultural scene. 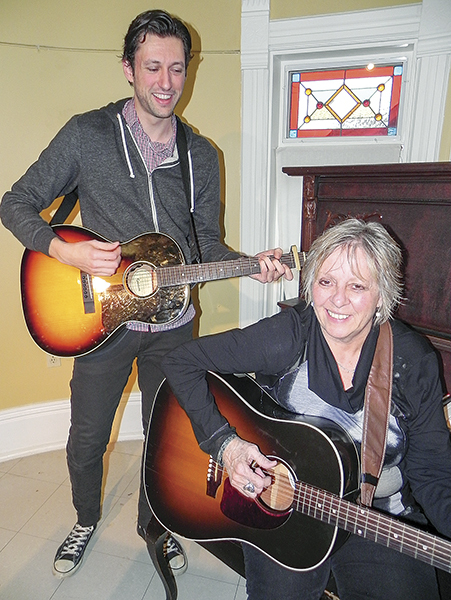 On April 11, she and Sarnia singer-songwriter John Pilat are launching The Open Stage at the Lawrence House Centre for the Arts. Burgess, sister of the late tenor Michael Burgess, is an experienced folk, blues and jazz entertainer. She’s released three albums and has a long history of performing live in the Ottawa area. Eighteen months ago, she moved to Sarnia to be close to her elderly mom. The Open Stage will be held on the second and third Mondays of the month, available to anyone who wants to perform or listen to music, poetry, or storytelling. She hopes The Open Stage will have a heavy emphasis on music and original material. The Lawrence House Turret Room is equipped with a house guitar, a piano, and a sound system. “I got my chops going to open stages and I believe in the idea a lot,” said Burgess. “It’s not only about performing. I’d like it to include workshops and other special events. She and Pilat anticipate most performers will be on stage no more than 10 minutes. Burgess recently joined the board of directors at the Lawrence House and said she feels she’s found a group of like-minded people in her new community. Pilat said he is onboard to co-host The Open Stage nights because Sarnia needs to help hone upcoming talent. “I hope it becomes a Greenwich Village kind of thing where people support one another,” he said. WHAT: The Open Stage, a new performing arts event for musicians, writers, poets and observers. WHERE: The Turret Room at The Lawrence House, 127 Christina St. S.
WHEN: Second and third Mondays of each month. 7 p.m. – 9 p.m. Starts April 11. It’s free. Just show up to watch or perform. Alvinston artist Liana Russwurm has a show with fellow painter Peggy King until April 23 at Gallery in the Grove on Hamilton Road. Russwurm will speak at the gallery Wednesday, April 13 at 7 p.m. about the people who inspire her work and some of the techniques she uses. RSVP to galleryingrove@gmail.com as space is limited. The Arts Journal features cultural events and projects in our community. Direct your ideas to cathy.dobson@thesarniajournal.ca or 266-932-0985.